Now drink the traditional drink from ancient India by sipping on the Guruji’s Kesaria Thandai. It is a great way to beat the blazing summer heat with its tremendous cooling effect. Loaded with vitamins and minerals, it is also an antioxidant and nutritive agent. The Guruji’s Kesaria Thandai has a great taste and is perfect for maintaining good health. 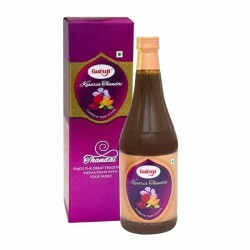 Guruji Kesaria Thandai is a superb and balanced blend of high quality Kesar, almond, cardamom, black pepper, rose water, khush-khush and magaj. Thandai is often described as the “God’s Drink” for its uniqueness. The quality ingredients of the drink endow one cold feeling and offer respite from the scorching heat.